Check Out Daryll B's Schomburg Black Comic Book Festival Synopsis! - Afronerd: The Blerd Revolution Has Begun! 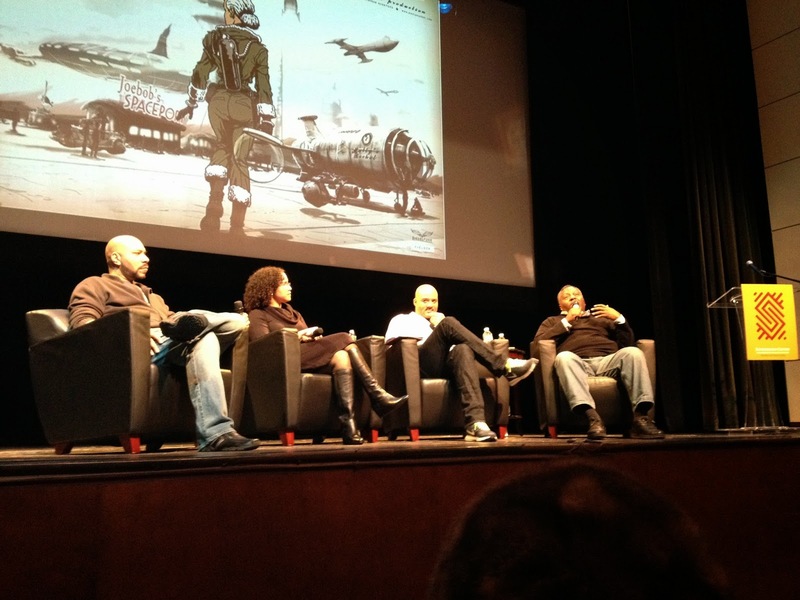 Home > Untagged Check Out Daryll B's Schomburg Black Comic Book Festival Synopsis! Check Out Daryll B's Schomburg Black Comic Book Festival Synopsis! As I lie here, both my computer and I are in recovery. Me, from a wild weekend and work. The laptop from an unexpected crash due to, well, I don't know what. So this blog will be a little scattered since my original version was unrecoverable. However, I got news from EVERYWHERE.. So strap yourselves in AfroNerd and Facebook Readers...this will be a doozy. First up, a couple of misadventures on Friday led me to my bud Jeff's Time Warp comic store in Hewlett, Long Island before work. You already know me folks, if I go in I have to pick up books. 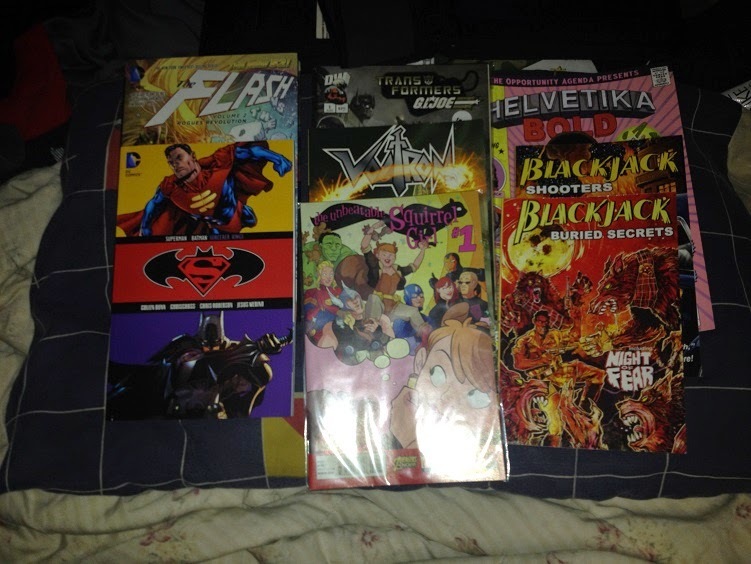 This time I came out with Superman/Batman Sorcerer Kings, The Unbeatable Squirrel-Girl #1, and Nu52 Flash Vol. 2 Rogues Revolution. -Seeing Professor Ben Foster doing his thing on the vendor floor, greeting and talking to EVERYONE. Man is probably our elder statesman yet has a seemingly infinite battery when it comes to conventions. I feel old seeing him in action. -Getting into the Publisher's Panel which was moderated by John Jennings (SUNY Buffalo/Kid Code) with Zetta Elliott (The Deep), Alex Simmons (BlackJack), and Tim Fielder (Matty’s Rocket). First off, John Jennings, along with Jerry Craft, helped organize the convention here AND the one that happened in San Francisco. Secondly, Alex Simmons' bantering with Tim Fielder was HILARIOUS! I managed to pick up two of Mr. Simmons' Blackjack books and really have to get in touch with Mr. Fielder to come on The ComicShoppe for a future episode. Finally, my biggest regret this year was not remembering to visit Zetta Elliot's table. I love the look of The Deep and that along with Fielder's Matty's Rocket are on my must get list now. -We also got to meet Gan Golan and Betsy Richards with their mini manager, the creators of the comic Helvetika Bold. Picture Wonder Woman crossed with Foxy Brown in an early '70s comic. Complete with parodies of the classic comic book ads like x-ray glasses and decoder rings. The great thing about this was the joy and enthusiasm that Gan and Betsy had not only for their book but for the convention itself. That fun never gets old. -It is time for the main event: we sat in on the Controlling Our Images Panel which was moderated by Regine Sawyer (Lockett Down Productions) with Msindo Kuumba (Art Director/2D Lead Artist/Visual Artist), Grey Williamson (Artist/Author), Robert Garrett (Xmoor Studios), and Alithia Martinez (Artist/Author). OHMIGOSH was this a spirited panel. Let me say that Msindo is a fantastic creator but he has a career as a motivation speaker and guide. His stories mesmerized the audience and hopefully lit a creative fire in some. Mr. Garrett was soft spoken but you could see the knowledge and years of experience with in him. Also I am not abashed to say that seeing the verbal jousting between Mr. Williamson and Ms. Martinez was thought provoking and seriously, if they got a podcast show in the vein of His and Hers about the industry, it would be a must listen to for everyone. I was worn out after this but inspired. Sunday. Yeah Daryll B. had a little too much to drink Saturday Night with the buds after the comic-con and had to sober up to watch the NFL Championship Games. So I popped on Zombie With A Shotgun which I was planning to review for a later show. The 5 episode web serial by Hilton Ruiz is about, well, you see the title. ZWAS runs approximately 5 minutes and up per episode and is a prime example of what I have been talking about. We have the means now to make whatever you want, whenever you want. Mr. Ruiz knows what he's shooting here and doesn't try to go over the top with the premise. The interesting thing about the story is that the hero is slowly turning and we all know he is going to turn but that isn't rushed. That builds up the suspense even more for the audience, who will wonder which traumatic situation will be the one to force the "final change". I often say that in things like this, I often gauge the actors/actresses to see how "into" the project they are and let me tell you, this looked like everyone had a blast. So much so that guess what's getting the graphic novel treatment and a movie poster? Yep. Zombie With A Shotgun. Look at the first episode...preferably with the lights on and a bulletproof vest. Make the choice for yourself. If you liked Project Terror from Grindhouse, I think you will like these webisodes. Can you believe I have room for links too? That's right! Milestone is on its way BACK! Static gets a live action treatment and now I might get Blood Syndicate back?!?!?! Come on 2015 with your bad self! -I often talk about music. Well on Fandomania, Chad lists his favorite geek music albums of 2014. I knew of Ms. Carter's lineage however I bet you some of her Wonder Woman admirers just had to do a spit take. Yes ladies and gents, we have had a Latina Wonder Woman and you ADORED her. Oh this is PRICELESS!!! OK I am tired. That was a lot of words but AWESOME memories. Thank you all who made it to the end of this. I adore you all. I need sleep. Until Next Time Readers, Keep Fantasizing!